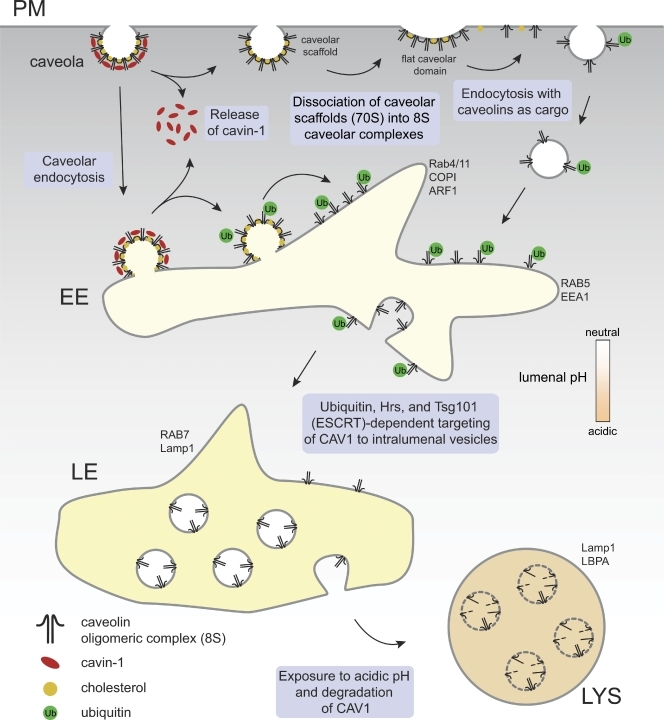 HBV enters the cell through caveolae-mediated endocytosis (Macovei et al. 2010 ) Rating=1 (Hao et al. 2011 ) Rating=2. Caveolae are specialized lipid rafts that form 50-70 nm flask-shaped invaginations of the plasma membrane. The virion is presumably internalized in the caveolae upon binding to host receptors, and subsequently delivered to the early endosome. The latter matures into late endosome, accompanied by a pH acidification down to pH 6.0. Most virus entering the cell through endocytosis use clathrins. The few shown to enter through caveolin-mediated endocytosis are polyomavirus, hepadnavirus, and few picornavirus, retrovirus and papillomavirus. Interestingly, most these viruses are replicating in the nucleus. Publication rating Rating=0: Conclusions of the paper have been controverted and are possibly wrong. Rating=1: Conclusions of the paper rely on weak experimental evidences, and/or have not yet been confirmed by another lab. Rating=2: Conclusions of the paper are based on convincing experimental evidences, and/or have been confirmed. Disclaimer: The publication rating is an assessment of the annotation retrieved from the publication, and does not reflect the value of the whole paper.